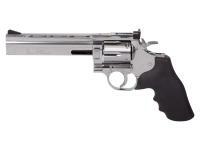 The classy Dan Wesson Model 715 double-action revolver is back in production. For revolver lovers, that is welcome news. This highly accurate airgun replica features all the details that you find on the real firearm. 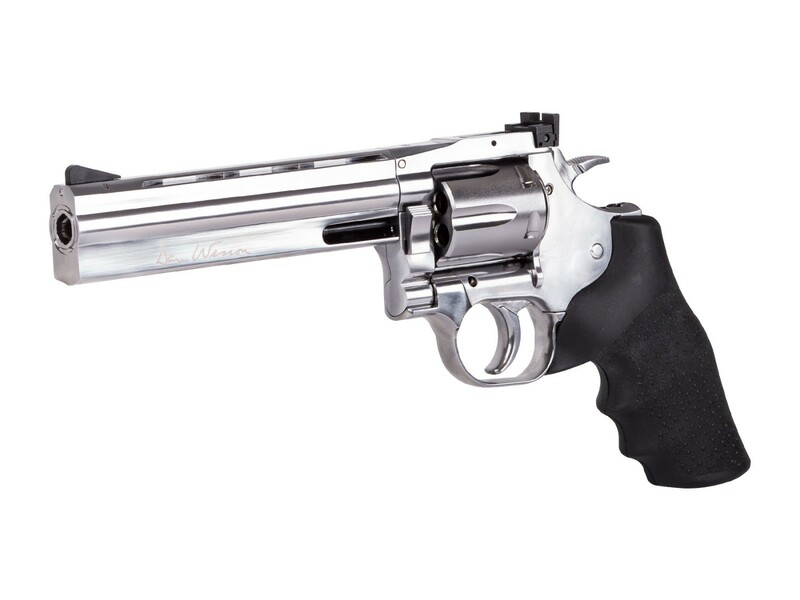 From the one-piece 6-inch heavy barrel, complete with vent rib with threading for mounting accessories, to the Hogue rubber grip. 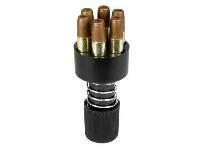 The grip shell has an ingenious integrated tool for tightening the CO2 cartridge that powers the revolver. Even the forward cylinder latch and the clockwise rotation of the cylinder have been precisely replicated from the real firearm. 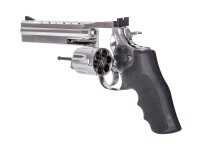 Dan Wesson revolvers became legendary as the preferred choice of serious revolver hunters and competition shooters because they were extremely well made and accurate; now the legend has been reborn in airguns. Things I liked: Very happy with this purchase. What others should know: Fine product. Things I liked: It looks real , weight , the sound when you shoot . Things I would have changed: All most every 6 shoot sesion , a bb fall from the gun when shooting . I don't know if it is the shells that are not hold tight the bb's or is the gun obviosly this is a major problem so it's not worth the money I am sorry to say that it a dissapointment this gun to me . 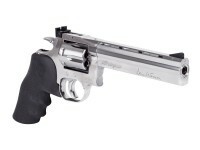 Things I liked: Dan Wesson and ASG have just raised the bar on bb revolvers! The engineering and integrity of this gun is simply fantastic. The rubber grips are amazing and the loading and tightening of the CO2 cartridge is simple and efficient with wrench being part of the grip. Superior sights, nice power that lasts 70 - 80 shots per CO2 and it is still winter. All of the functionality of this gun is smooth as silk, no loose parts or wobbles of any kind. I own the traditional 8" Dan Wesson silver pistol, and this gun far outshines that one, and that one used to be my favorite in both size weight feel and accuracy. With the 715 I am shooting 1.25 inch groups at 20 feet, the sights are fully adjustable and the balance and feel of this gun from the grips make it a pleasure to shoot. The trigger shoots great and single and double action, single action is a very light touch and you will be dead on with your aim if you relax and let the gun do the shooting. 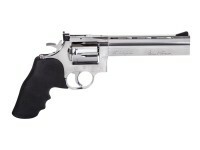 Things I would have changed: Honestly, Nothing to change on this one, all of the normal minor issues or comments about the other Dan Wesson pistols have been resolved, ASG hits a home run with this gun and when they come out wither other colors and sizes I will feel compelled to get another one. What others should know: Mine seems to shoot well with any bb's: but seems to shoot best with the Hornady black diamond steel bb's and Daisy zinc coated precision bb's. The mechanical engineering is far superior to any revolver out there on the market, this gun is a real bargain at these prices. Can I shoot .177 darts out of this gun ? How does this gun compare with others? This Airgun (BB) version of the DW715 appears to be plated, possibly in nickel.